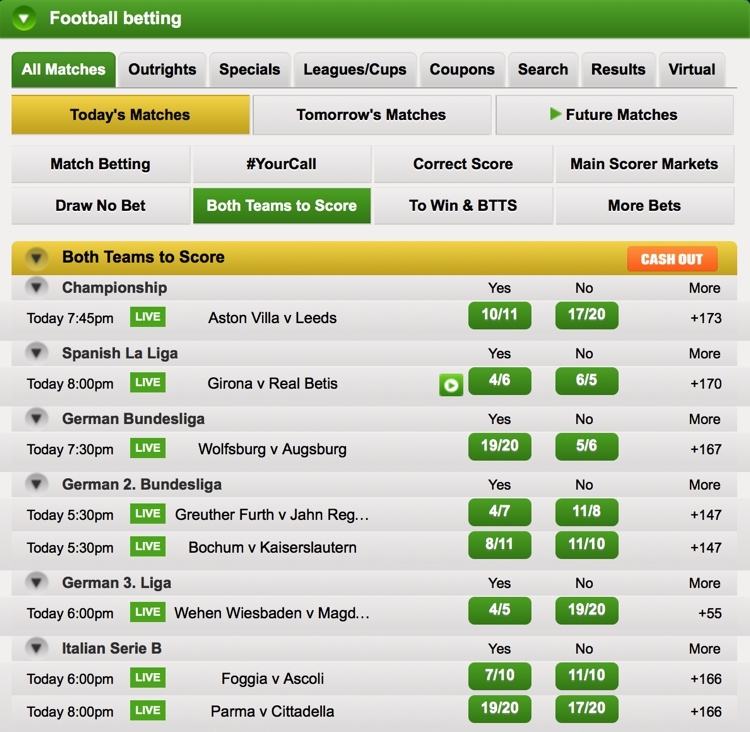 A Both Teams to Score bet is a great one to place as it does exactly what it says on the tin. You’re betting on whether or not both teams playing in a match are going to score a goal, with the option available to bet on ‘Yes’, meaning you think they both will, or ‘No’, which is your assumption that there won’t be a goal from both sides competing in the match. It’s also a good one to place as from a betting point of view, goals can make a bet a winner or kill it stone dead. Believe it or not, bookmakers can actually be quite generous with the way they count certain goals, with Own Goals not counting towards First / Last / Anytime Goalscorer wagers, for example, meaning that they won’t become losers if a player you haven’t bet on scores against their own team. Here, I’ll have a look at the Both Teams to Score bet, looking at how often it happens and how you can use that information to help you with your bets. What Does ‘Both Teams to Score’ Mean? Following on from the rules I’ve instigated elsewhere on this site, I’m going to start off by having a look at what this bet actually means. Thankfully, a bet on Both Teams To Score isn’t a complicated one to understand, given that it does exactly what it says on the tin. You’re either presuming that both teams taking part in a match will score a goal within the regulation ninety minutes, or that they won’t. I’ve written an in-depth piece on the 90 Minute Rule elsewhere, so I won’t go over that ground again here. The important thing to realise is that if you’re watching a match in a knockout competition such as the FA Cup or the Champions League then the bet won’t carry on over into extra-time or penalties, should the game go that far. The joy of this bet is that it doesn’t matter how the goals are scored, it only matters whether they are or not. What I mean by that is that you’re betting on whether both teams register a goal or not, so it doesn’t matter if they’re own goals, dodgy penalties that shouldn’t have been given or scrappy goals that only go in because the goalkeeper was arguing with someone in the crowd at the time. If they are officially logged by the Press Association then they count and your bet is a winner or loser accordingly. You’re also not requiring a given number of goals to be scored – this isn’t like a Correct Score bet, when a bet on 2-2 requires the game to finish 2-2 after ninety. If the score is 95-1 then that’s absolutely fine (or not, depending on your bet). Both Teams To Score, or BTTS as it’s sometimes written, is often a bet that people will go for if there’s no value in the Match Result market. That’s not to say that there’s guaranteed to be better value here, but more often than not it’s a bet that has slightly better odds than the 1X2 market, unless you’re betting on the underdog there. If you have a look at the offers on BTTS and there’s nothing that tickles your fancy in terms of odds then you might want to consider opting for the Both Teams To Score & Team X To Win option instead. As the name suggests, that requires both teams to get themselves on the score sheet and the team you’ve selected to win the match. Another variation is the Both Score No Draw market. Again, this one is fairly self-explanatory and requires both of the sides playing in the match to score but for the game not to end in a draw. In the Wolfsburg v Augsburg match I’ve taken a screenshot of there, the visitors were 13/5 to win outright with William Hill, but that moved to 6/1 if you opted for them to win and Both Teams To Score. Wolfsburg to win, meanwhile, was 11/10. Opting for the Both Score No Draw market would not only give you slightly longer odds but also allow Augsburg to pull off a shock and yet your bet will still be a winner as long as both sides get on the scoresheet. It’s definitely worth thinking about if you reckon the game might be a barn-burner full of goals but you aren’t sure which way it’s going to go. We can see from that table that one-hundred and eighty-six games across a three-hundred and eight season campaign ended without both teams scoring. That’s the equivalent of 48.9% of BTTS bets being losers. In other words, you’ll have had pretty much a one-in-two chance of your bet coming in, whichever way round you’d chosen to place it, if you’d bet on the Both Teams To Score market throughout the entirety of the 2016-2017 Premier League season. If you know you’ve got as close to a 50% chance of your bet coming in, then, what can you do to figure out which way to place the bet? As always, my answer here is ‘research, research, research’. There are so many resources out there that you can turn to see how matches are likely to go. None of them are certainties, obviously, but if you look at a team and see that it has a brilliant scoring record when away from home and the team they’re visiting has a dreadful defensive record when playing in their own ground then you can be reasonably confident that the away side is going to get on the scoresheet. If the home team also has a poor record of scoring goals at home then you might want to opt for ‘No’ when it comes to the BTTS market. The best value you’re likely to find is when one of the Big Six goes up against one of the sides towards the bottom of the league who have a good scoring record at home. Have a look at the games that have gone before and see when the side from the top of the table has struggled to stop the opposition from scoring. Do they struggle to defend set-pieces against sides that have tall players, for example? If so, how are they likely to cope against a team with a six-foot seven centre-forward whose goals have all come from corners? The top sides are often at the top-end of the Premier League because they know how to score goals, but no team in the history of the division has won without conceding a single goal. Figuring out what their weakness is is how to find winning bets with decent odds. Who is the match referee? Do they have previous for giving away soft penalties? What about their assistants? Have they regularly failed to flag offsides in past matches? Have the officials in general been more generous when officiating one team over another? We all like to believe the Football Association when they say that referees are impartial, but a quick a look at the stats will show that that’s probably not the case. That’s to say nothing of the fact that some officials are much quicker to give penalties than others. If the referee of the match you’re watching tends to be rather free-wheeling with his penalty awards then that’s something worth bearing in mind when it’s time to place your BTTS bets. After all, even the lowliest team can score from a penalty, regardless of the level of the opposition. The final thing I’ll mention is the way both teams are likely to line-up. Has one team had a rock-solid centre-half playing all season who’s picked up an injury? Is the player that’s come in to replace him as good? Is he inexperienced or has he been out injured for a while? That will tell you a lot about what to expect from his side in a defensive manner. similarly, has the attacking team been reliant on a player who has been scoring for fun but is now out of the game because of injury or suspension? That might be something that influences his team’s ability to put the ball in the back of the net. You can normally find out such info from all of the regular sources, but it’s always worth having a look at the forums and social media accounts of supporters of every club who always seem to be in the know.